Located in the Banyuwangi Regency of Eastern Java, Rustam Shrimp Farm is the prototypical Indonesian shrimp growing operation. With rectangular, 1,000 square meter ponds and an intensive stocking density of 150 shrimp per m2, the farm demands an adequately mixed and oxygenated aquatic environment to ensure productivity and biosecurity. Mr. Rustam, the farm owner, and Mr. Tarom, the lead farm technician, constantly monitor the ponds for disease and water quality. When the farm was established the ponds were aerated exclusively with paddlewheels. During the first year of the farm’s operation, the ponds began to stratify, due to insufficient vertical mixing. By the end of the harvest cycle, many of the shrimp had become infected with IMNV (Infectious Mionecrosis Virus), which resulted in high levels of mortality and lost profits. In response to these commercial misfortunes and less than ideal water conditions, Mr. Rustam and Mr. Tarom considered ways to improve vertical mixing, and thus reduce susceptibility to disease. They eventually decided to supplement and replace their paddlewheel aerators with Aire-O2® Series II aspirator aerators. During the next growing season, they carried out a trial with three different scenarios: 100% paddlewheels in one pond, a 50/50 combination of Aire-O2 aspirators and paddlewheels in another pond, and 100% Aire-O2 aspirators in a third pond. At the end of the trial, Mr. Tarom said the pond with 100% Aire-O2 aspirators produced the most shrimp and generated the highest profits. The pond yielded 60 shrimp/kg in 70 days. Furthermore, the 100% Aire-O2 pond most consistently maintained a dissolved oxygen (DO) level of 5.0 ppm. Unrelated to the pond’s productivity, Mr. Tarom also said that the Aire-O2 ponds (100% Aire-O2 and 50/50 combination) required far less maintenance than the 100% paddlewheel pond. The results of the trial prompted Mr. Rustam and Mr. Tarom to retrofit their entire farm with more Aire-O2 aspirators. Since this transition, the Rustam Farm has benefited from increased electrical efficiency, reduced aerator maintenance, longer aerator service life, and improved yields. Additionally, Mr. Tarom asserts that the Aire-O2 aspirators’ stable and consistent oxygen transfer rate cause the shrimp to feel less stressed. 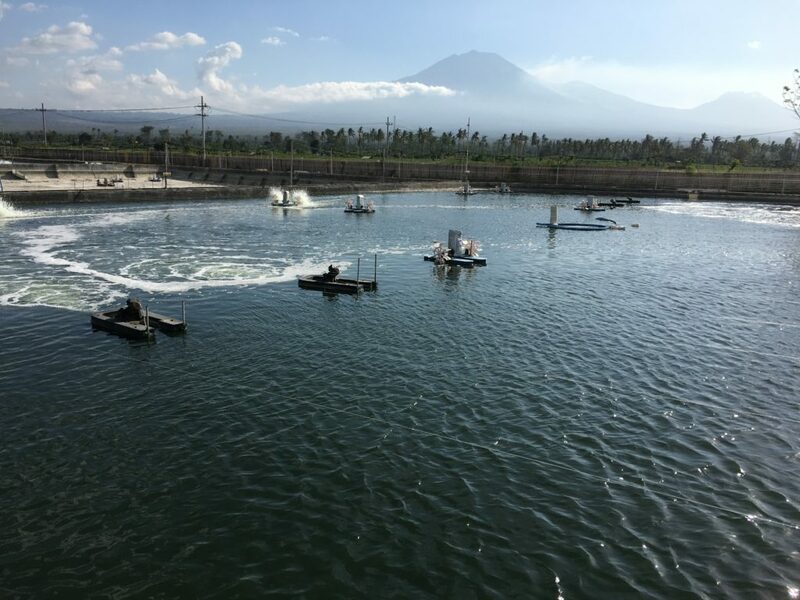 For the Rustam Shrimp Farm, there is no doubt that the Aire-O2 Series II aspirator aerator has been critical to the biosecurity, profitability, and overall success of the farm.